The September 15, 2016 edition of Biological Psychiatry is devoted to updates in the area of psychobiology that relate to depression and its treatment. In this blog post I will summarize some of those studies to give you a sense of what is going on in the field. Some of these studies may not be replicated in follow-up research, but some of them may end up leading to significant advances in the area of treating depression. Creatine was found to be effective in augmenting response to serotonin reuptake inhibitors in women in one recent study, but was found to be no more effective than placebo in another. In this follow up article, Yoon and colleagues used multimodal neuroimaging in a randomized clinical trial of female patients with major depressive disorder and found that the creatine group showed increased prefrontal N-acetylaspartate levels and greater neuronal connections in the prefrontal cortex. N-acetylaspartate levels are thought to be a marker for changes in neuronal density, neuronal function, or mitochondrial function. The authors suggest that improvements in depression-related metabolic and network dysfunction may underlie the ability of creatine to enhance antidepressant efficacy. Ketamine is an exciting experimental treatment for depression. Unfortunately, it is a generic medication which means that no drug companies are funding research on how it should be dosed, who it works for, what follow up treatment should take place for those who respond to initial infusions. Esketamine is the S enantiomer of ketamine which is felt to be the active form of the compound and is patented as a treatment by Janssen. Esketamine has received “Breakthrough” designation from the FDA, designed to accelerate research on the compound. 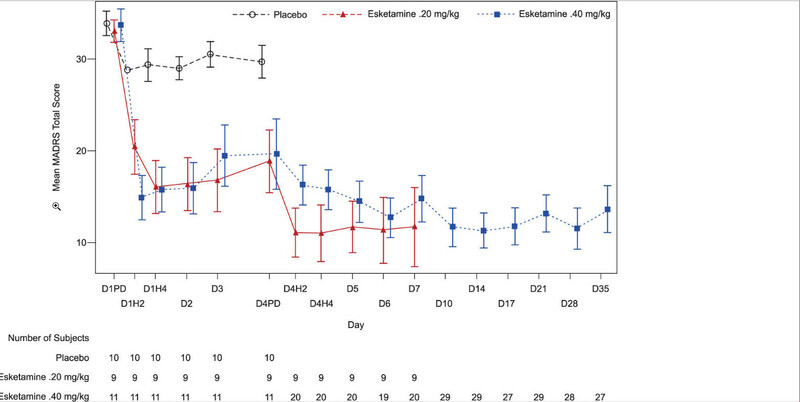 Singh, et al report the results of a multicenter, double-blind, randomized, placebo controlled trial of esketamine infusion (esketamine is also being studied using nasal administration) in adults with treatment resistant depression. They found that two-thirds of patients treated with 0.20 or 0.40 mg/kg esketamine showed rapid and significant improvement in symptoms of depression. Adverse effects were dose dependent and included headache, nausea and dissociation. Treatment response was not dose dependent suggesting that the lower dose may be preferred. The study involved infusions of either saline, or one of the two doses of esketamine on day 1 and day 4 and included an optional follow up with additional infusions through day 35. After completing the DB treatment phase, patients—with clinical input from the physician investigators—could choose to receive up to four optional open-label treatments of IV esketamine .40 mg/kg (or lower) on days 7, 10, 14, and 17. The results are summarized below and indicate a clear treatment effect. Still unclear is how much follow up treatment will be necessary and whether this treatment will need to be given by infusion, which will obviously limit availability and increase cost. Chronic social stress is a model for depression in mice. Koo et al used real time optogenetic stimulation to show that brain-derived neurotrophic factor signaling in the limbic area of the brain, but not dopamine signaling, was associated with depressive-like behaviors. This is compatible with the theory that depression is not primarily related to alterations in dopamine, serotonin and norepinephrine systems but rather alterations in BDNF activity. Finally, Keynan developed an elegant way of providing real time feedback to control human subjects about the level of activity in the amygdala. They showed that their technique, which allows monitoring of amygdala activity by EEG allowed subjects to reduce amygdala activity and improve emotion regulation. This opens the door to a biofeedback approach to stress, PTSD and perhaps depression.